No-one enjoys conflict and least of all, conflict in the workplace. It is somewhat easier to manage conflict among friends or family as there are a whole armoury of social and cultural tools that can be used. But managing conflict in the workplace means using a specific set of skills that requires diplomacy, tact and subtlety. Conflict in the workplace happens. It happens at all levels in all industries. It is just a fact of life. If you are in management, you will inevitably have to intervene in such a dispute. To be an effective manager means being an effective communicator. That includes creating an open communication environment in your workplace by encouraging employees to talk about work issues. Listening to employee concerns will foster an open environment. Make sure you really understand what employees are saying by asking questions and focusing on their perception of the problem. How often have you seen otherwise intelligent professionals self-destruct because they would not engage out of a fear of conflict? Putting your head in the sand and hoping that conflict will pass you by is not the most effective methodology for problem-solving. Conflict rarely resolves itself – in fact, conflict normally escalates if not dealt with swiftly and decisively. It is not unusual to see what might have been a non-event manifest itself into a monumental problem if not resolved early on. And it does not matter how petty the disagreement may seem to those not involved, your immediate response to the conflict is essential. Here are some tips you can use when faced with employees who can’t resolve their own conflicts. Do not try and pretend it’s not happening or to downplay the importance to the participants. Engage, and make sure you stress you are here to help and find a workable solution to both parties. Also, separate those involved and sit down with them and give them space to voice their concerns. Make certain you listen. There will be bad feelings and emotions will be running high. This means that it may be hard to get to the heart of the problem. However, this is where the ability to truly listen comes into play. The goal of conflict resolution is not to get to a right or wrong situation. The aim is to reach a solution that everyone can live with. Looking first for needs, rather than solutions, is a powerful tool for generating win-win options. Furthermore, to discover needs, you must try to find out why people want the solutions they initially proposed. Once you understand the advantages their solutions have for them, you have discovered their needs. In essence, you are aiming for the perfect zero-sum game. 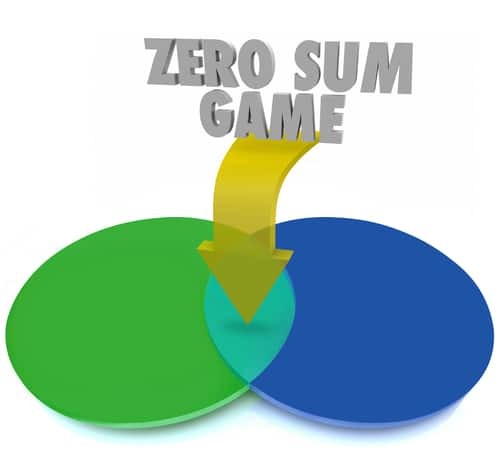 The term Zero Sum game comes from game theory and says each person’s gain or loss is exactly balanced by the losses or gains of the other participants. Consequently, if the total gains of the employees are added up, and the total losses are subtracted, they will sum to zero. In the world of conflict mediation, it has been borrowed to add weight to the idea of a win-win solution. If the conflict is causing a disruption in the workplace and remains unresolved, you may need to explore other avenues. Therefore, an outside facilitator may be able to offer other insights into solving the problem. In some cases, the conflict can become a performance issue. In this case, it may become a topic for performance appraisals, coaching sessions, or even disciplinary action. The most common reason that conflict in the workplace escalates is that nobody does anything. Everyone thinks they are right and are waiting for the other person to admit they are wrong. It may be unpleasant to tackle conflicts, but it gets left to worsen unchecked.